I remember curling up in my favorite cozy chair in the living room of my childhood home, my special reading spot, devouring Charlotte's Web. E.B. White's classic novel is the first (but far from the last) book to make me cry, and I loved every word of it. 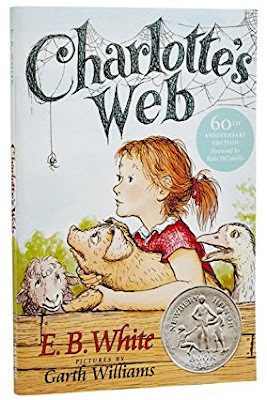 So when I saw that this month's Poppins Book Nook theme was Newbery Award Winners, there was no doubt that our choice would be Charlotte's Web. 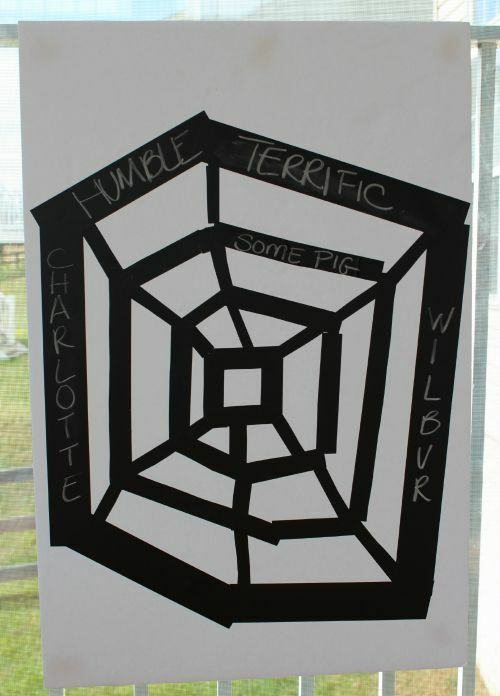 Charlotte's Web has been delighting readers young and old for generations. My boys are a little young to appreciate it fully, but we've been listening to a lovely audio version read by the author himself on our car trips and they are enjoying it. They love spiders and pigs, and with Halloween fast approaching I thought we could put together a really fun spider themed activity based on one of my favorite parts of Charlotte's Web. 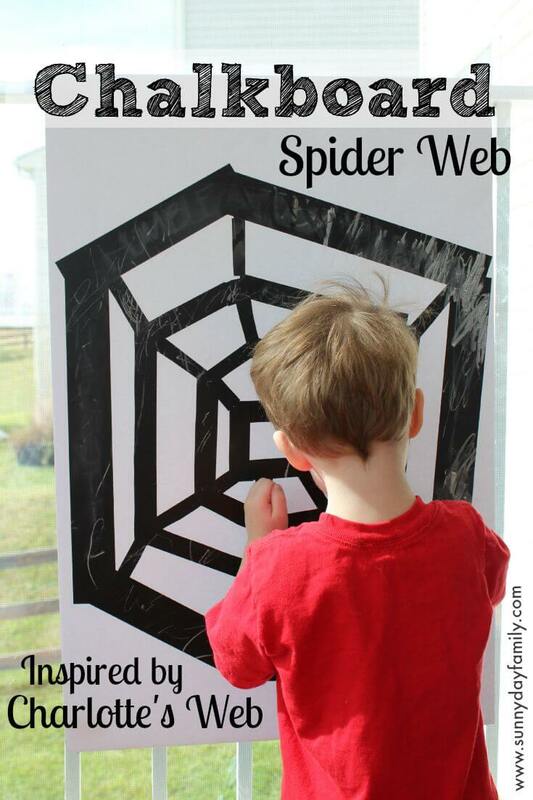 Start by drawing a spider web design onto your foam or poster board. Then cover your pencil lines with the chalkboard tape. My boys loved helping with this! The tape is wide, so you will need to cut it in half or thirds depending on your drawing. Once your design is complete, you can use painter's tape to hang the spider web on a wall or door so that your children can more easily write on it. You can also lay it on a table or on the floor. Use chalk to write or draw on the tape. I got us started by writing a few words inspired by Charlotte's Web. Then I invited the boys to play. They loved it! They are big fans of the eraser, so they started by erasing the words. They aren't quite writing letters yet but they had a blast drawing on the spider web. I added a few letters so that they could work on letter recognition too. This activity is a really fun way to practice just about any writing or reading skill: letter recognition, sight words, or even just coloring in the lines. We loved it! 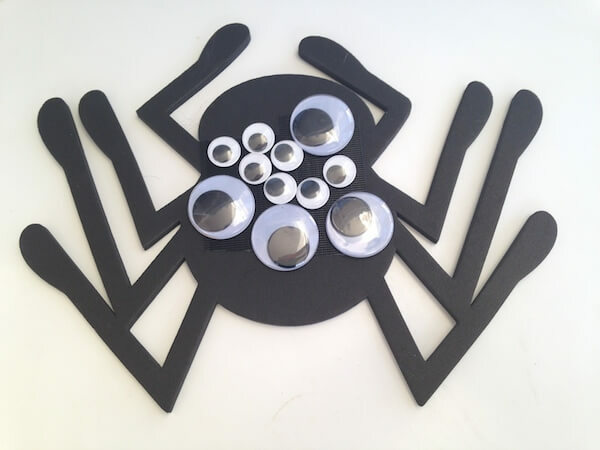 For more awesome spider fun, try our Sticky Eye Spider Fine Motor Activity! I love this idea! We need to try audio books! Also Who knew chalkboard tape existed?! I've got to get some! Right - it's awesome! We love audio books for the car.